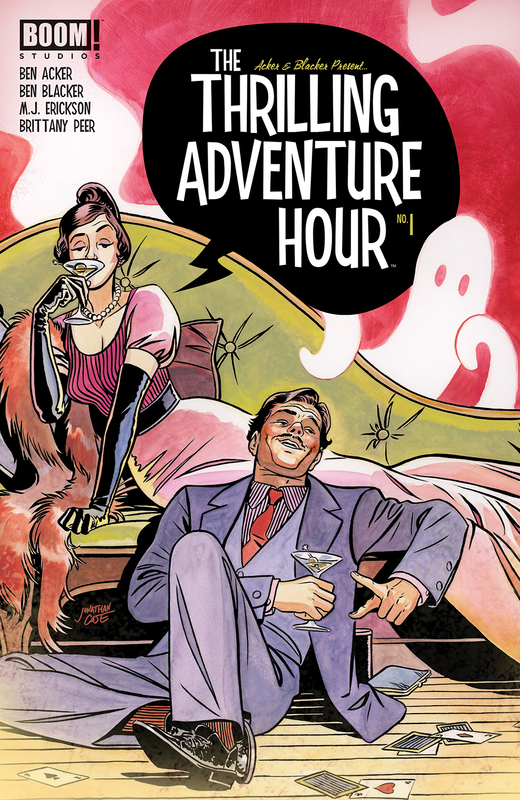 Thrilling Adventure Hour #1 review: Introduces those married mediums to a new audience – AiPT! In this introduction of the Thrilling Adventure Hour universe to a comics audience, Frank and Sadie Doyle start off the series, setting our comics to spooky. In this introduction of the Thrilling Adventure Hour universe to a comics audience, Frank and Sadie Doyle start off the series, setting our comics to spooky. Is it good? The comic opens in Switzerland, where a couple of delivery guys are very disturbed by some boxes they’ve picked up from mysterious castle. Back in New York, a journalist monologues as he follows a potential story, a man named Adam Silver, from place to place. Switching to their penthouse apartment, Frank and Sadie are quipping and drinking, their two favorite pastimes, while entertaining their friends Dave and Donna Henderson. Adam Silver shows up at their door, begging for the Doyle’s help – he knows they see ghosts and sometimes help people get rid of them. They agree to go, and the Hendersons decide to tag along for fun, though Dave has reservations. And for good reason: the house is indeed haunted and the ghost is not messing around. I’m a huge fan of The Thrilling Adventure Hour podcast, so I know how difficult it can be to translate what makes a great podcast, especially a fully scripted and brilliantly voice-acted one like TAH into a non-audible medium like comics. What this translation has going for it is same excellent writing of Bens Acker and Blacker. I could hear Paget Brewster and Paul F. Tompkins (Sadie and Frank on the podcast) in my head as their comic counterparts spoke. I also liked the mixing in of other genres with the noir-style flatfoot journalist. M.J. Erickson has a fun, loose style that matches the playfulness of the story, and enhanced by Brittany Peer’s watercolor-like colors. However, I think there was a missed opportunity, and I’m not sure whose call it was. Frank and Sadie are based on Nick and Nora Charles from the Thin Man movies, and their segment of the show always played as vintage, with all the vocal performances having an old Hollywood quality. Here, Frank and Sadie are still styled that way (with a nice nod to Paul F. Tompkins’ singular style), and the journalist is also playing with the tropes of that era, but Donna and Dave are dressed much more modern. The art overall also has a fairly contemporary style, and it would have been fun to see more of that vintage look and feel.